Wow. Cool galaxy. 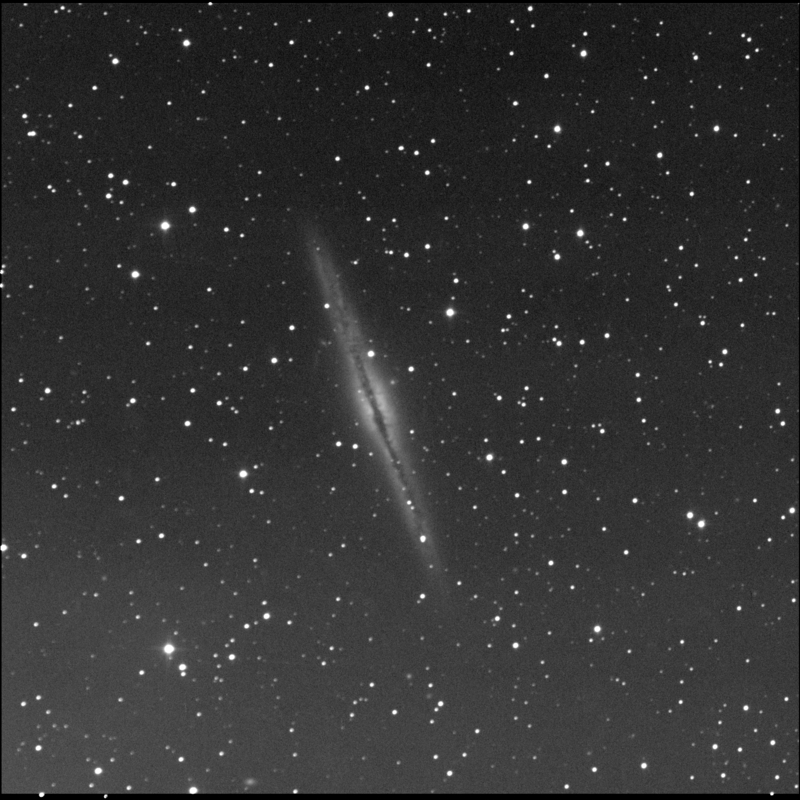 BGO captured NGC 891 for me. 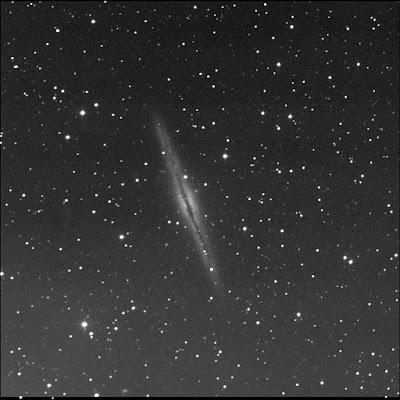 This edge-on galaxy is in Andromeda (aka Caldwell 23). It is one of the RASC Finest NGCs. There's a bit of a gradient; not surprising given the moonlight. On the east edge of the galaxy, slight above the bulge, there is something going on. An oval and a wisp. I suspect the oval is a background galaxy. Possibly it is a small satellite! But the wisp?! Dunno! On the west edge of the bulge there is a bright round fuzzy. I wonder if this a large globular cluster or a large satellite galaxy to 891. Very neat. At the bottom edge of the frame, to the south-south-east of the galaxy, is a distant oval galaxy. This is PGC 9042. Due south of the galaxy is a small round lint ball. This is LEDA 2194478. In the image, I see another fuzzy near the aforementioned, below and right, or south-west. Slightly fainter. It is not identified by SkyTools. The bright star is the bottom left is double ES 1501. I cannot split the A and B stars. North-east of ES 1501 is a small round fuzz ball. Again, not identified in my software. Tried again on 3 September but did not get a full data set.